Such an inspirational evening at the FDM Everywoman in Technology Awards! Incredibly proud to have dressed the Everywoman founders Karen Benson and Maxine Gill. 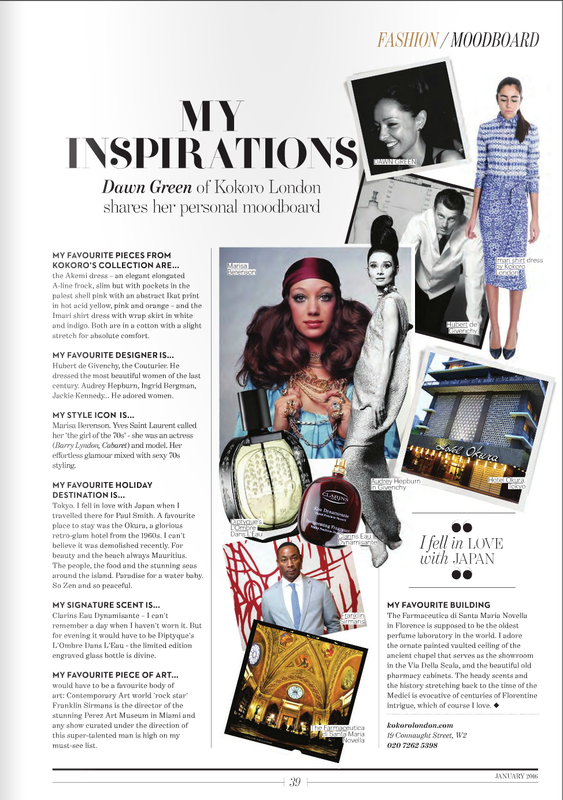 Get to know Dawn Green, our founder and creative director in the new issue of Absolutely Magazine Notting Hill January edition. In the midst of the various fashion weeks, we too have become dizzied by spells of summer trends, colours and holiday plans fated in the distant future...Lest we forget, Autumn has just begun! So we present to you pieces you can adorn your figure and wardrobe with now! Pair the Mr Kitsune Scarf with block colours and shapes for a boyish relaxed look. Scarf and Sweater KOKORO London, Culottes from Tibi, Shoes Amelie Pichard. We recently did a giveaway for these limited edition scarves which are taken from an original drawing by our dear friend and Irezumi Tattoo artist - Alex Reinke, AKA Horikitsune, who kindly gifted the artwork of a two-tailed fox to mark the beginning of our journey as KOKORO London. As always, our silk and cashmere blend scarves are spun by an artisan factory at the base of Mount Fuji, and printed in Kyoto; the whisper-weight and luxurious scarves are the perfect travel companion and year round accessory. Break the rules and pair monochrome with cream! The Boyfriend sweater is spun from the finest Italian yarn, and features a crew knit! This classic style is cut for the perfect relaxed fit. A smart staple; pair this with everything from tailored pants to printed skirts. A muted colour palette puts an emphasis on the jacket's pattern play. Contrast with bright accessories for a complimentary spin on the classic look. Jacket and sweater from KOKORO London. Shoes from Amelie Pichard. Drop crotch trousers ByWalid. Earring and ring from Alice Cicolini. (all available in store). The Origami cardigan is an easy layering piece over sweaters! The Boyfriend sweater is paired with the Kyoto shirt for an easy going office apropros look. Cropped cardigan, boyfriend sweater and Kyoto Skirt from KOKORO London. Shoes from Gucci and Earrings Alice Cicolini. The cropped extra fine Cariaggi yarn cardigan is our must have layer piece for this season! This slightly loose-fitting piece is cropped and looks chic with high-waisted pants and made to layer over shirts and dresses. The subtle pleat detail hem adds formality to this wardrobe staple. Temper the relaxed silhouette of the cardigan with skinny pants or over a shirt dress. Cardigan from KOKORO London, Shirt form ByWalid (available in store). Skinny flared pants from MiH and Shoes from Amelie Pichard. Our Giant Wave Cashmere Cardigan is screen printed with Hokusai's 'Giant Wave' and cut with a flattering waterfall front. This is a cozy must have winter cardigan that can be worn with all! Wear it with our 'Boyfriend' sweater in fuchsia or the ByWalid antique lace shirt with sandals for a desk to dinner look. Origami Cardigan and Kyoto Skirt from KOKORO London. Shirt from ByWalid (available in store. Jewellery (before) by Alice Cicolini, available in store. Shoes by Dolce and Gabbana. Make a statement in our silk satin midi pencil skirt. Fully lined in silk habotai, this figure-skimming style is cut to sit high at the most flattering point of your waist. This skirt print is taken from an original drawing by Irezumi tattoo artists Alex Reinke, AKA Horikitsune, who gifted us this work as we began our journey as KOKORO London. This piece alongside others are coming soon to the store and the website.